I had an email from Pat telling me there was a lump on the side of the A51, near to the junction with Abnalls Lane. I assumed that it was an old tree stump, but Pat thinks it might be something more than that, and recalls seeing some stone there last year. I went and had a closer look. Pat said in his comment on the Cross City post, the lump is covered in vegetation, but there is likely to be something solid underneath, as the grass is cut around it. I took a few photos and then the self -conciousness of being stood on a busy A-road taking photos of a grassy lump got the better of me and I headed back up Abnalls Lane. So, does anyone else know anything about this, or do we just have to wait until the grass dies away in the Autumn to get a better look?! In the meantime, it’s worth taking a trip up Abnalls Lane. In parts, it’s thought to be a holloway, and at times you’re surrounded by hedgerows, tree roots and sandstone, with carved names and dripping water. 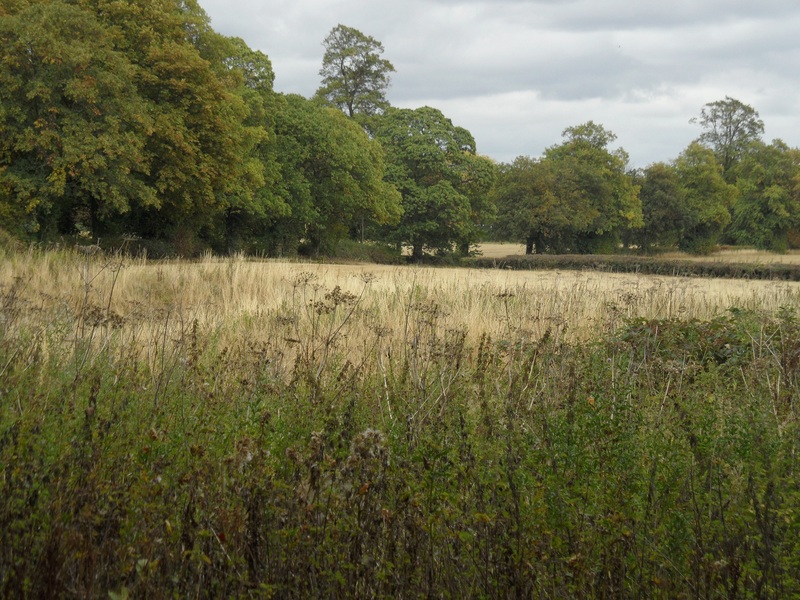 It takes you past the site of one of Lichfield’s Scheduled Ancient Monuments – a moated site on the edge of Pipe Green and over the border into Burntwood. It also passes nearby the site of Erasmus Darwin’s botanical garden, although unfortunately the site is not open to the public. The road, now Abnalls Lane, was known as Pipe Lane at least between 1464 and 1683. The point where it goes over the boundary was described in 1597 as ‘the place where the broken cross in Pipe Lane stood’; a ditch at Broken Cross was mentioned in 1467. Is this one of the crosses already counted in Cross City, or a different one? Also, on the subject of research into stone things, at the end of Abnalls Lane, there are some interesting names – The Roche and Hobstonehill (according to the History of the County of Stafford, the placename ‘Hobbestone’ was mentioned in 1392). I think I need to spend my summer holidays at Lichfield Record Office. ‘Townships: Burntwood’, A History of the County of Stafford: Volume 14: Lichfield (1990), pp. 195-205. URL: http://www.british-history.ac.uk/report.aspx?compid=42356 Date accessed: 27 July 2012. I’ve referenced J(ohn) W(alters) Jackson several times in this blog and really wanted to find out a bit more about him. So here we go…. Mr Jackson was 2 years old when he came to Lichfield in 1864. He was a music teacher and the organist at Christ Church. He lived at 81, Walsall Rd until he left the city to live with his son in Newport, Shropshire in October 1940 at the age of 78. During his time in Lichfield he was ‘City Librarian’. The Lichfield Mercury reported that after his appointment the number of readers increased from 70 a week to 500. In the 1930s and 40s, Mr Jackson had a local history column in the Lichfield Mercury in which he answered readers’ queries and shared an assortment of historical facts, folklore and transciptions from old documents. Each ‘subject’ is given a paragraph at most, so if one snippet didn’t interest, the next one wasn’t far behind! I thought I’d share one of my favorites with you, to give you a flavour of Mr Jackson’s work. I like this one especially because the ancient manor of Abnalls is one of my favourite places in Lichfield and I love a good ghost story (this one has the added bonus of an intrepid one-man paranormal investigation as well). So I’ll hand you over to Mr Jackson….. The site of the old manor off Abnalls Lane. I know it doesn't look it from the photo but it is very intriguing place and a scheduled ancient monument.The aerial view from googlemaps reveals a lot more but I'm having trouble adding it to the post at the minute, so in the meantime, maybe do your own investigation & see if you can find it! This kind of history might not be to everyone’s taste (but then what is?) but it sure is to mine – I think it’s entertaining, accessible and a great source of information. If you get the chance I highly recommend that you have a look at the Lichfield Mercury archives (warning – give yourself plenty of time as you’ll be engrossed). I love the way that us humans, no matter what age we belong to, are curious about the stories of the places that surround us and the people that came before us (well, most of us are anyway). Investigate the blog list to the right of this post and you’ll find a lot of curious* & entertaining souls. I like to think that if Mr Jackson was around today, he’d be doing a blog. I hope he doesn’t mind being included on this one!